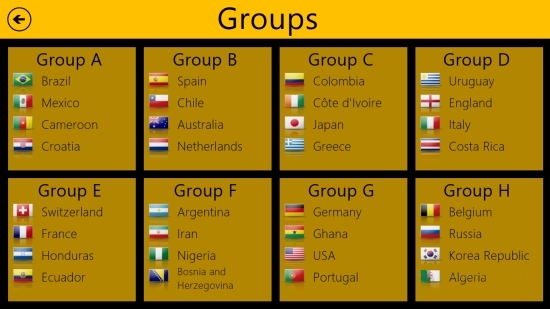 World Cup 2014 Free is a Windows 8 FIFA World Cup 2014 app. The app will provide you with all the required information that you need to know about these games. Information about the teams, the schedule that is to be followed, about the players from these teams, and other things is available through the app. The app will turn out to be a useful tool for all the football enthusiasts who are looking forward to these games. It is freely available in the Sport category of the Windows Store. The FIFA World Cup is the world’s biggest single event sporting competition. It is contested by the senior men’s national teams from 208 Member Associations of FIFA. The Competition started in 1930, and is played after every 4 years. This time the FIFA World cup is hosted by Brazil. The competition would be held from 11 June 2014 to 11 July 2014. A total of 32 teams are taking part in the competition this time. The competition would be held over a span of one month. The phase is also known as the Final Competition, wherein the teams for the final competition are decided according to the previous three years, which are also referred as Qualification Rounds. As you get to the main landing page of the app, the main options that are available through the app, will be available as rectangular tiles. These are mainly Groups, Teams, Stadiums, Calendars, and Play- Offs. Teams have been grouped into 8 groups, A to H. 4 teams are included in each groups. If you get to any of the mentioned groups, you would be shown all the teams of that group, on the left side of the page. On the right side, the teams from that groups, which will be competing against each other, would be displayed in separate panels along with the date of the match. Go to any of the teams on the left side to get details about it. Get to the Teams option, and you would be shown all the teams taking part in the competition. Click on any of the team to get details about the team. Click on the Current Squad option to get players details. Click on any of the player, and its details would be shown in a panel on the bottom right side. 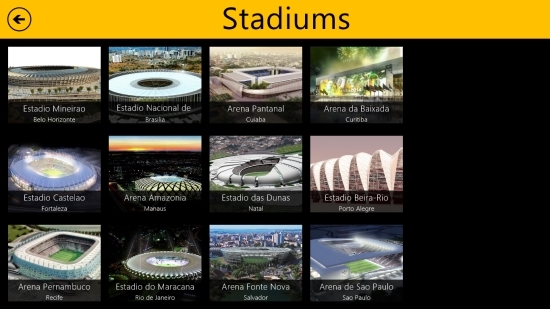 Use the Stadiums option to see all the stadiums where the matches will be held. Get to any of the stadium to see details about the matches. Get to this option to see the group stage calendar, and the play off calendar. 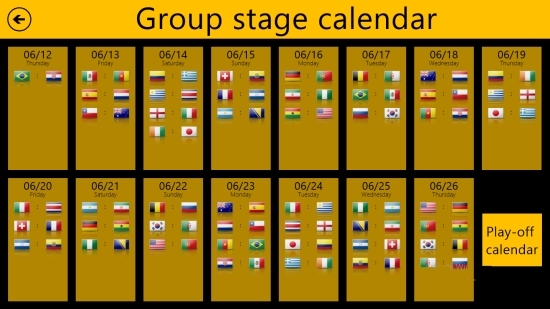 In the group stage calendar, dates are assigned in separate panels in which the participating teams between which matches will take place is shown. Use this option to see the general play off scheme of the competition. Also check THE Football App and Sports Illustrated. 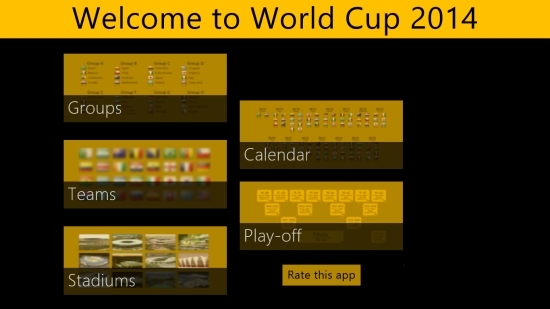 According to me, the app is a nice Windows 8 FIFA World Cup 2014 App. Use it to get all the information you need about the schedules, teams, and other information about the competition. Get World Cup 2014 Free here.